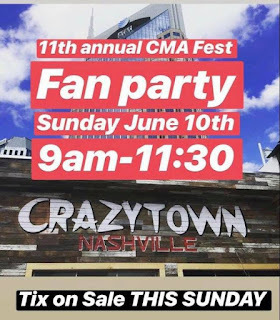 Chuck Wicks Announces 11th Annual Fan Party to Take Place During #CMAFest! Chuck Wicks has announced that he will be holding his 11th Annual Fan Party at Crazytown (308 Broadway) on Sunday, June 10, 2018 from 9 AM - 11:30 AM! Tickets on sale Sunday, May 27, 2018. Follow Chuck on social media for details! Tickets: On sale Sunday, May 27, 2018. Follow Chuck on social media for details.